I walked around the gardens on Saturday taking lots of photos and thought this trellis looked good for a picture. It divides one garden theme from another. 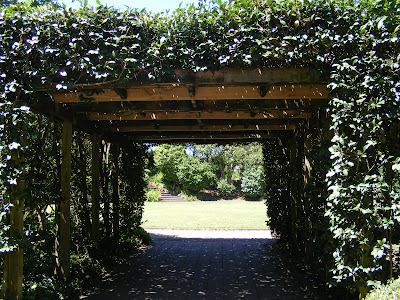 The Hamilton Gardens complex is well worth one or several visits. I'd be visiting Hamilton Gardens as often as I could! We travelled around North Island in April 2010 and after visiting Hamilton Gardens once, we made sure to have a return trip through Hamilton so we could go back. I loved how the gardens had changed in just the few weeks between our visits, but that's the beauty of gardens, really, isn't it?